EnviroStart technology takes the user a big step beyond conventional soft start systems. Soft Starts carry the intelligence to ease a motor into operation by ramping up the voltage and/or current, to apply the power progressively. An MEC (Motor Energy Control), such as EnviroStart, does this and more. The EnviroStart MEC makes use of powerful microprocessor technology to monitor the utility and loading of the motor and make sure the input power is matched exactly to the changing torque demands of theload. Any change, up or down, in the load demand is recognised by the EnviroStart and correction fed to the motor in typically less than 12 microseconds. This provision of energy, only when needed, not only saves electricity costs, but also reduces wear on the electrical equipment and offers increased protection to the motor and connected load. A smooth acceleration or slow-down reduces stress on transmission systems giving the motor longer life with reduced maintenance costs to motors and load. In addition, EnviroStart has been specially designed to meet the needs of applications in areas of the world which may suffer from fluctuating power supplies or climatic problems. All units have been tested to withstand supply voltage drops to 60% of nominal line without overheating or causing damage to either the unit itself or the motor. 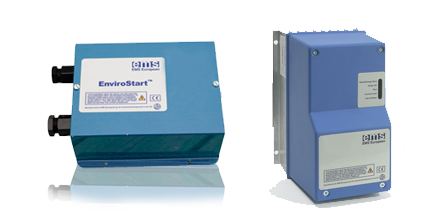 EnviroStart, Soft Starts and Motor Energy Controls are suitable for any caged rotor (squirrel cage) AC induction motor, or slip ring motor, and are designed to be easily installed. Because theEnviroStart relates the energy required for the motor to its task at any moment of time, the motor works at close to optimal efficiency at all times. From the moment it is fitted, the EnviroStart will give a return on your investment. Pay-back period will vary depending on the energy needs of the motor and cost of electricity, but even the smallest business will see an immediate drop in energy costs from day one. Greater efficiency and control means less energy used, providing conservation with power management. EMS (European) have also designed a single phase smart MEC, integrating real time clock switch-on, switch-off capability with motor energy control and dead band management. Energy savings of over 40% are readily achieved using the Enviro+ products. During the course of mid 2007 EMS (European) added power factor correction systems to their product range with the introduction of the EnviroVAr systems. Providing standard and detuned systems which incorporate harmonic reduction components. EnviroVAr is a high specification site reactive power compensation component. In early 2009 EMS (European) added the EnviroCab small business power factor correction systems providing a standard 10kVAr to 50kVAr correction unit for use where low levels of compensation are required. Complementing this local Pf correction elements were also made available for environments where only one or two inductive loads were to be found on a site.